Our High Visibility Vest With Logo is an essential part of attire when you are working in the dark or near dusk. In this hectic world we live in where everyone is rushing to get somewhere, it's vital that if you are working or even just walking near a road that you keep yourself seen at all times to avoid getting hit. So visibility is absolute. 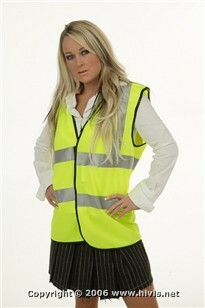 So our High Visibility Vest With Logo from Calendar Lady Promotions is an absolute must. We can have our High Visibility Vest With Logo printed up with your business details and company logo to ensure that you're advertised at all times. So help to promote your business details as well as keeping yourself safe at night with our High Visibility Vest With Logo. To find out more about our High Visibility Vest With Logo click here and fill in the contact form and we'll get straight back to you. Other promotional and personalised items besides our High Visibility Vest With Logo click here.